So, you’re about to start your searching for your new home. It’s exciting, it’s fun but it’s also quite stressful too. There’s no point letting the stress escalate and become an issue, so make sure you’re as prepared as you can be before you even start your search! What are the things you want to have in your next home? Who are you living with and how many bedrooms will you need? Do you want outdoor space or city centre living? Do you need parking? Have a ‘wish list’ and divide it into sections – starting with what you really need to have and then the things that you could live without. 2. It’s time to start your search! Once you have that list sorted and you and your future housemates are agreed, it’s time to start your property search. Now, at this point, I have to mention Unipol. 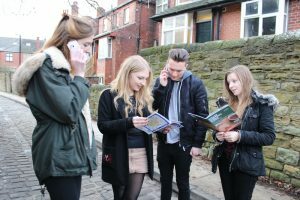 We’re the only not-for-profit housing charity in Leeds, which basically means we reinvest our profits into improving properties and living standards across the city. We want students to have a stress-free, enjoyable stay in any of our properties or halls. If you rent with a Unipol Code Approved landlord, you know you’ll be in safe hands as these landlords go above and beyond legal requirements to provide a safe and high-quality property, to keep your mind at ease. You can search for properties on our website – www.unipol.org.uk – and then filter by criteria such as number of bedrooms, cost or location. It’s as simple as that. 3. Next up is to create a shortlist of your favourite properties. It’s best to have a mixture of properties you like the look of and not just set your sights on only one – that could lead to disappointment! 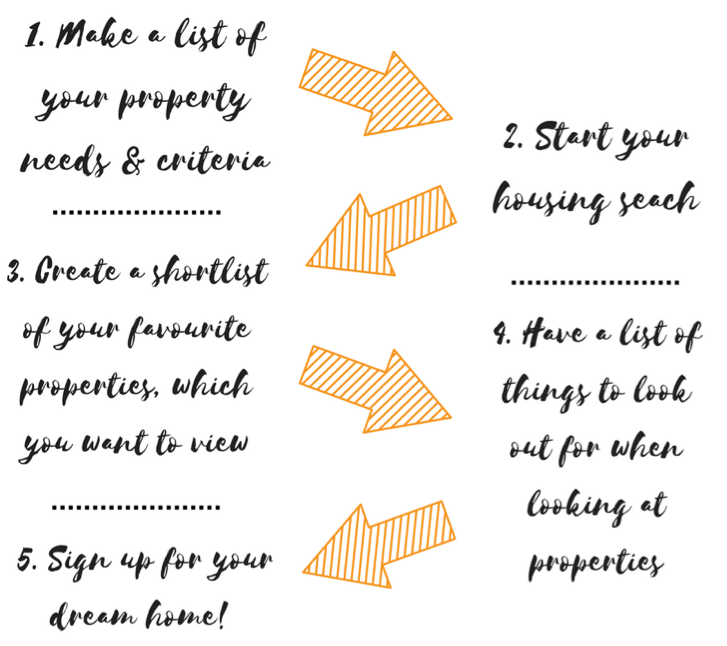 Once you have your shortlist in place, book in some viewings and try to make sure you arrange a date and time that everyone can go, that way when it comes to decide which property to sign for, everyone is likely to be happy with the decision as they know what to expect. If someone can’t make a viewing, try to think of different ways you could show them around – could you facetime them while at the property? Take lots of pictures for them? Make sure they feel included and informed. 4. So you’ve arranged your viewing. Online, this looks like your dream property. But create a checklist to go through when you view the property. How much is the rent & do you need to put down a deposit? Is it affordable for everyone? What furniture is provided and what will you need to purchase? Check which other amenities will be included – such as microwave, toaster, microwave, vacuum cleaner etc. Is there enough parking & will it be safe? Will you feel safe living there? Particularly walking home at night, being home alone etc. What condition is the property in – is there any damage? Are there any signs of damp? Any broken items of furniture? Is the property safe, with correct ventilation, checked electrical appliances, a gas safety certificate and an adequate fire escape route? Are the locks on the doors and windows secure? How and when is your rubbish collected? Is there a wheelie bin or communal rubbish area? 5. Now you’ve viewed your shortlisted properties and have settled on ‘the one’ it’s time to sign up for a property! If you rent with Unipol we’ll guide you through the process so it’s as straight forward and hassle-free as possible. No hidden fees or surprise costs, we’ll be upfront and honest from the start. We’ll be posting a separate blog post about signing up for a property, so keep your eyes peeled for that soon!